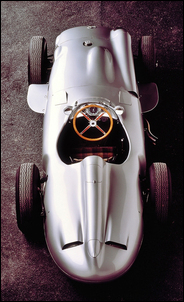 The Mercedes-Benz W 196 R designed for the 1954 season met all the demands of the new Grand Prix formula decreed by the sport's governing body: a capacity of 750 cc with or 2500 cc without supercharger, free choice of fuel mixture, and a racing distance of 300 kilometres or a minimum of three hours. 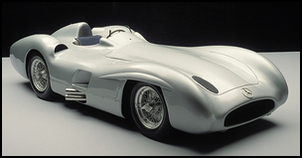 Two version of the car were built: streamlined…. …and more conventional in appearance with exposed wheels. The streamlined version was completed first because the Reims race, that started the season, permitted very high speeds. Fritz Nallinger was in charge of the project as a whole, assisted by Rudolf Uhlenhaut, Chief Engineer of the racing department since 1936, and after the war also head of the Car Testing department. This silver masterpiece, of which 14 units including a prototype were built, drove its competitors to despair over the following two years. Its tubular space frame was light (36kg) and stiff. Giant, turbo-cooled (and at first centrally arranged) Duplex drum brakes were fitted. 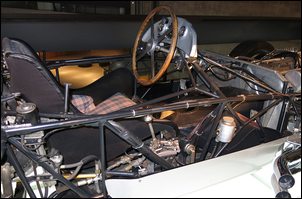 The 2.5 litres, naturally aspirated eight-cylinder in-line engine was installed in the space frame at an angle of 53 degrees to the right to lower the centre of gravity and reduce frontal area. 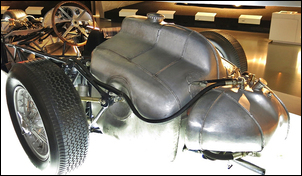 In 1954 it had 256hp at 8260 rpm; by 1955 this had risen to 290hp at 8500 rpm. The engine used a built-up crankshaft with one-piece con-rods. Stroke was 68.8mm and the bore was 76mm. The two versions of the W 196 R were interchangeable quite effortlessly. Chassis number ten, for instance, was entered with open wheels in the 1955 Argentinean Grand Prix and the Dutch Grand Prix, and then in fully streamlined form performed tests in Monza. The body form used depended upon the peculiarities of the circuit, the strategy chosen and the likes and dislikes of the respective driver. 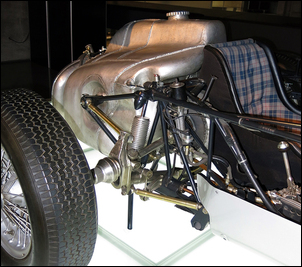 The W 196 R featured a rear suspension swing axles with a low pivot point instead of the customary De Dion layout – a configuration justified by Uhlenhaut for its better behaviour under acceleration. Rear roll centre height was 6 inches. Longitudinal location of the rear hubs was by Watts linkages and springing used torsion bars. 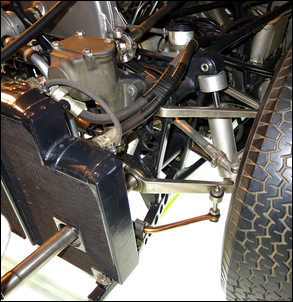 Front suspension also used torsion bars, but this time with double wishbones. Telescopic dampers were fitted front and back. 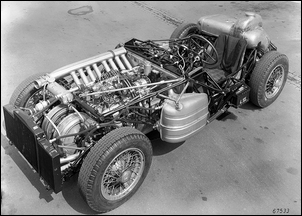 The car was designed to have a high polar moment of inertia, with heavy elements located in the extremities of the W 196 R. The water and oil coolers were right at the front, the huge tanks holding petrol and oil in the tail. 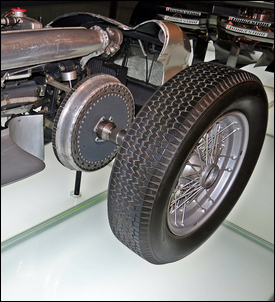 In 1955 the front drum brakes were relocated into the wheels on some cars, while three different wheelbase lengths were available: 2150 millimetres, 2210 millimetres, and 2350 millimetres. The shortest was ideally suited for the tight round-the-houses circuit in Monaco. 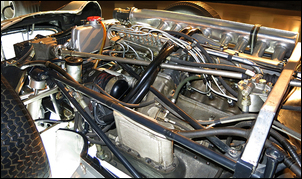 The straight eight used desmodromic valve operation, where the valves were closed by the action of the cams and rocker arms, rather than by springs. This allowed the use of larger and heavier valves (50mm inlet valve diameter! ), and higher rpm. Two valves were used per cylinder. A long tubular inlet plenum chamber was used with a single throttle body positioned at the front. Long ram-inlets fed air to each cylinder. The mechanical fuel injection pump, developed together with Bosch and not unlike the ones used in diesel engines, consisted of a casing with eight cylinders which fed the fuel straight into the combustion chambers at a pressure of 100 kilograms per square centimetre (about 1400 psi). The eight-cylinder in-line configuration was inspired by the famous 18/100 hp Grand Prix car of 1914 in that the cylinders (two groups of four, with central power take-off) were firmly connected to a base plate, through-bolted to an aluminium casing separate from the valve gear housing and surrounded by a welded-on cooling-water jacket. The fuel used was a highly reactive Esso mixture with code RD 1, concocted from 45 percent benzene, 25 percent methanol, 25 percent 110/130 octane petrol, three percent acetone und two percent nitro-benzene. This blend would have eaten away a tank made of unprotected steel overnight…. 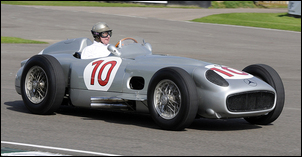 The W 196 R's track record was impressive indeed: nine victories and fastest laps, as well as eight pole positions in the twelve Grand Prix races in which it was entered, and Fangio's world champion’s titles in 1954 and 1955.